These biscuits only have 3 ingredients in them. Yep. That’s it. Three! Salted butter is cut into self-rising flour before being mixed with milk or buttermilk. And just like that, you have a buttery biscuit dough ready to hit the oven! Baking Tip: Every cup of self-rising flour contains roughly the equivalent of 1 1/2 teaspoons of baking powder and 1/4 teaspoon of salt. Baking Tip: Every stick (4 oz) of butter contains roughly the equivalent of 1/4 teaspoon of salt. Because buttermilk is cultured, it has an acidic quality to it. I personally love the tang that buttermilk brings to biscuits. If you do not have any on hand or do not prefer buttermilk you can definitely use any other kind of milk. Skim milk will produce a biscuit that is less rich in flavor, while biscuits made with whole milk will taste heartier. Baking Tip: If you want your biscuits to have the tang of buttermilk, but you do not have any on hand, you can easily make a substitute! Put 1 tablespoon white vinegar or lemon juice in a liquid measuring cup and add enough milk to the measuring cup until it measures 1 cup. Stir and let stand for 5 minutes before adding it to your dough. 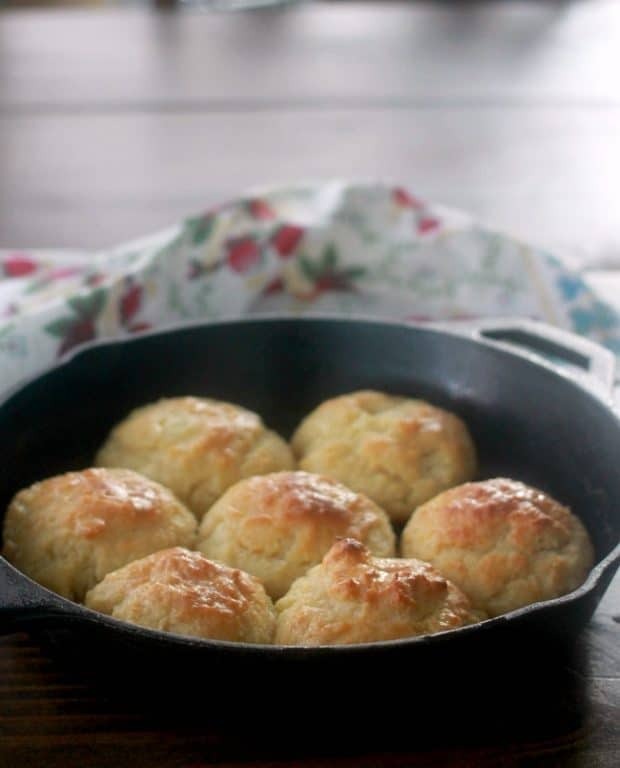 In addition to the baking powder, the steam created when the water in the butter and the milk start to evaporate is what really helps the biscuits to rise. 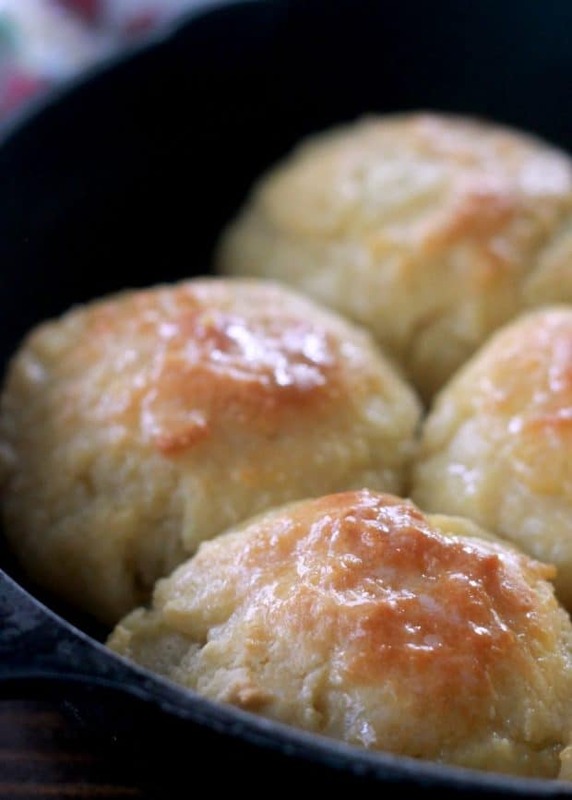 Using cold butter and milk is key to get rapid evaporation and steam once the biscuits hit the oven. Baking Tip: When making a recipe that calls for cold ingredients, leave them in the refrigerator until right before you need to add them. Once the milk is added into the flour mixture and stirred, the gluten structure starts forming immediately. Gluten is necessary to hold the structure of these biscuits, but you want to control how much it develops. The more the gluten structure develops, the tougher the biscuits get. You want to stir the milk into the flour mixture just until it is combined. This will only take about 10-15 seconds of stirring. Then stop! The mixture will look lumpy but that’s okay. You are going to have super light and fluffy biscuits! -> Try this easy Sausage Gravy Recipe with your biscuits! Measure out your flour by fluffing it up with a spoon, lightly spooning it into your measuring cup being careful not to pack it down, and level it off. 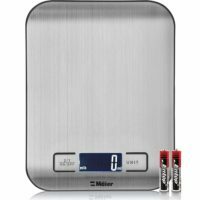 Or use a scale to measure by weight. Place in a large mixing bowl. Cut your cold butter into small chunks and add it into your flour. 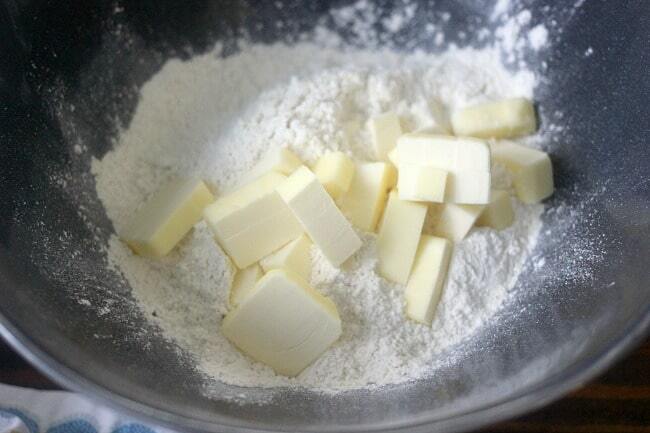 Using a pastry cutter or a fork, cut the butter into the flour until it is the texture of coarse meal. 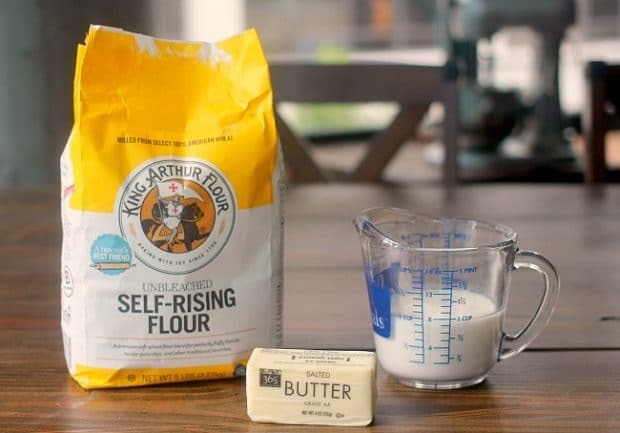 Add about 3/4 cup of the cold milk into your flour and butter mixture and stir using a spoon or rubber spatula, not a whisk, just until the flour is incorporated, about 10-15 seconds. Add more milk as needed to bring the consistency to a very thick batter. You want it thin enough that it could not be rolled out like a dough, but still very thick. See the video above for the right consistency. I usually need 1 cup, but you may need a little more or a little less. Do not over-mix your batter or you will have tough biscuits. 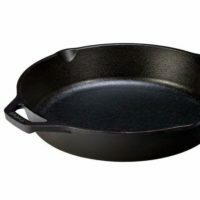 Using a 2 oz scoop or a 1/4 cup measuring cup, scoop out your biscuits into a cast iron skillet or onto a sheet pan lined with parchment paper. Place the biscuits in your preheated oven, and bake at 450 F (232 C) for 16-18 minutes, until golden brown. If desired, spoon melted butter over the top of the baked biscuits. Completely cooled biscuits can be wrapped in plastic wrap and stored in the freezer for up to 3 months. To refresh, warm in a 325 F (163 C) oven for about 10 minutes until warmed through. 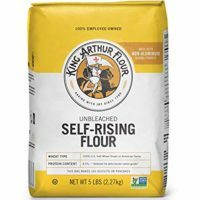 If you do not have self-rising flour, you can substitute it with all-purpose flour, baking powder, and salt. Measure out 2 1/4 cups (15.75 oz, 441 gr) all-purpose flour, 1 TBSP baking powder, and 1/2 tsp of salt. Whisk the ingredients together in a large mixing bowl before adding the butter. If you do not have salted butter, you can substitute it with unsalted butter and salt. Add 1/4 tsp of salt to the flour and whisk it together before adding in the butter. Use 1 stick (4 oz, 112 gr) unsalted butter in place of the salted butter. This recipe works well with regular milk and buttermilk. Buttermilk will give your biscuits more of a tangy flavor. You can use any variety of milk you have on hand: skim, 1%, 2% or whole. Whole milk will give the biscuits a richer flavor. You can also use non-dairy milk if you prefer. 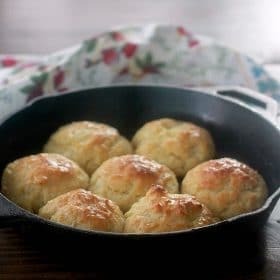 Buttermilk Substitute: If you want your biscuits to have the tang of buttermilk, but you do not have any on hand, you can easily make a substitute. Put 1 tablespoon of white vinegar or lemon juice in a liquid measuring cup and add milk to the cup until it measures 1 cup. Stir and let stand for 5 minutes before adding it to your dough. To make these biscuits gluten free: You can use any all-purpose gluten free baking blend in combination with 1 TBSP baking powder, and 1/2 tsp of salt. Whisk the ingredients together in a large mixing bowl before adding the butter.